Qiushi Chen; Marc R. Larochelle; Davis T. Weaver; et al. Importance Deaths due to opioid overdose have tripled in the last decade. Efforts to curb this trend have focused on restricting the prescription opioid supply; however, the near-term effects of such efforts are unknown. Objective To project effects of interventions to lower prescription opioid misuse on opioid overdose deaths from 2016 to 2025. 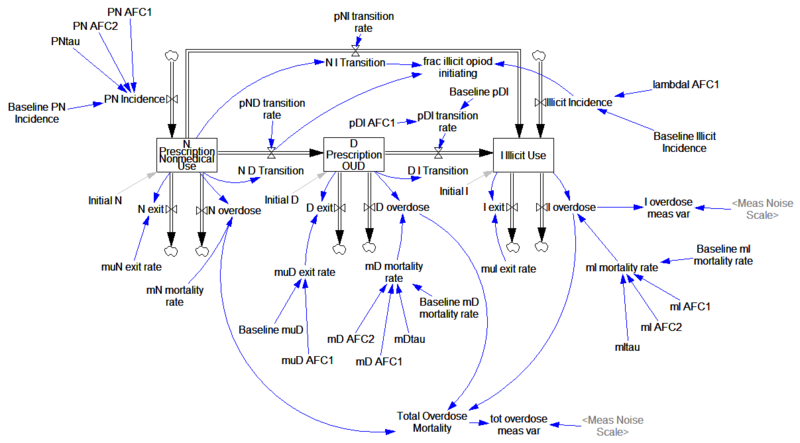 Design, Setting, and Participants This system dynamics (mathematical) model of the US opioid epidemic projected outcomes of simulated individuals who engage in nonmedical prescription or illicit opioid use from 2016 to 2025. The analysis was performed in 2018 by retrospectively calibrating the model from 2002 to 2015 data from the National Survey on Drug Use and Health and the Centers for Disease Control and Prevention. Conclusions and Relevance This study’s findings suggest that interventions targeting prescription opioid misuse such as prescription monitoring programs may have a modest effect, at best, on the number of opioid overdose deaths in the near future. Additional policy interventions are urgently needed to change the course of the epidemic. That’s actually OK with me, because I think I learn more from implementing the equations myself than I do if someone hands me a working model. While R gives you access to tremendous tools, I think it’s not a good environment for designing and testing dynamic models of significant size. You can’t easily inspect everything that’s going on, and there’s no easy facility for interactive testing. So, I was curious whether that would prove problematic in this case, because the model is small. 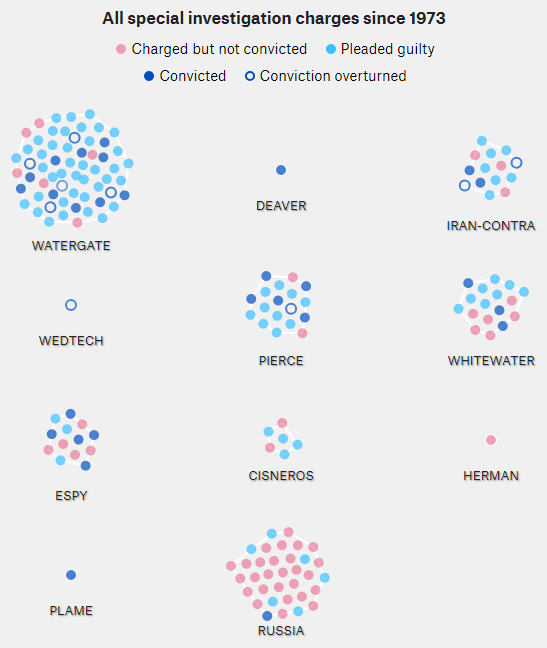 538 had this cool visualization of the Russia investigation in the context of Watergate, Whitewater, and other historic investigations. The original is fun to watch, but I found it hard to understand the time dynamics from the animation. For its maturity (660 days and counting), has the Russia investigation yielded more or fewer indictments than Watergate (1492 days total)? Are the indictments petering out, or accelerating? The model uses macros for pink noise generation and second-order trend smoothing, so it requires Vensim Pro or DSS or the free Model Reader. This is not an exact replication of the model (though you can plug in the parameters from C&S’ paper to replicate their results). I used slightly different estimation methods, a generalization of the logistic (for saturation exponent <> 1), and variable revenues and interest rates in the projections (also optional). This is a good illustration of how calibration payoffs work. The payoff in this model is actually a policy payoff, because the weighted sum-squared-error is calculated explicitly in the model. That makes it possible to generate Monte Carlo samples and filter them by SSE, and also makes it easier to estimate the scale and variation in the standard error of user base reports. The model is connected to input data in a spreadsheet. Most is drawn from the paper, but I updated users and revenues with the latest estimates I could find. A command script replicates optimization runs that fit the model to data for various values of the user carrying capacity K.
Note that there are two views, one for users, and one for financial projections. See my accompanying blog post for some reflections on the outcome. See my latest blog post for details.